Make a Proper Placement: Place the hinge at a spot on the door where you plan to mount it. As most regular doors need 2 hinges – one is placed 11 inches from the bottom, and the other 7 inches from the top. You can measure these distances using the tape, and mark them on the frame as well as the door. As these are heavy duty hinges, so there will be a third mark placed between the first and second hinges. Make Tracings Around the Hinge: Use a carpenter’s pencil to make traces around the hinges. Place your pencil on the jamb and the door, and carefully trace around the hinge. You can also make note of the depth of the hinge. Ensure that your outlines exactly match the location on the jamb or the door. You can use the router to cut the mortise on which the hinge plate will rest. Mark Location for the Screws and Drill Pilot Holes: Once you are done with the mortise, create pre-drill holes for mounting the screws. These screws will hold the hinge in the place. In this step, you can place the hinge on the mortise, and mark holes using the carpenter’s pencil. After marking the holes, use a screw driver to drill pilot holes ¼ʺ for each screw. These holes should be deep enough for the screws to fit into. Align Hinges: After drilling holes, align the hinges, and set screws by using an impact driver or 9/16ʺ socket set. Attach the Door: Hold the door manually to see it is fitting properly. You can prop the door by using some bricks or wooden planks at the bottom. Once the door is properly aligned, you can use bar clamps or C-clamps to hold the door in position. Drill the remaining pilot holes for the two hinge plates. Finally, set the lag screws until you feel they are tight enough to hold a door. You can remove the clamps to check the working of a door. If you feel that the door is not swinging properly, you can place some small shims between the rough opening as well as the door frame until you get a properly working door. If you find it difficult to follow the above-mentioned steps, you can always consider seeking the help of an expert. 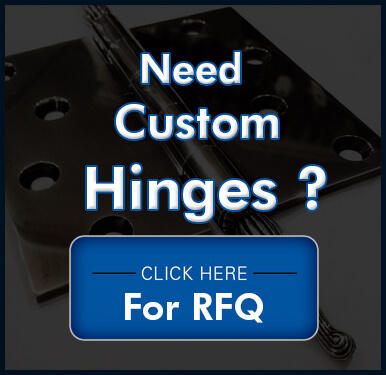 They will guide you through the process, and help you to complete heavy duty door hinges installation perfectly.